​See what can happen in just six minutes. Each year, the Burnham-Moores Center for Real Estate hosts a Real Estate Career Expo on the USD campus. 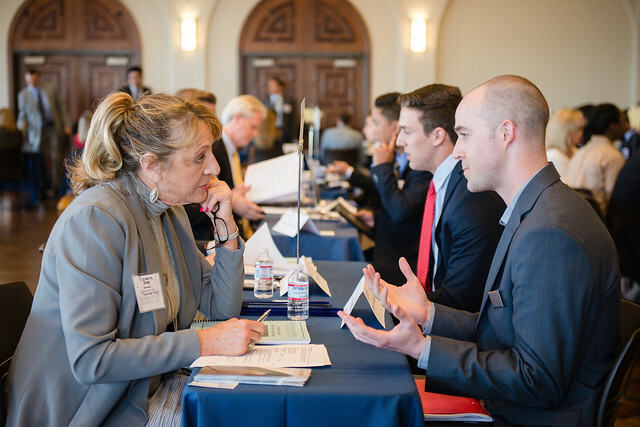 We bring in dozens of company representatives from the real estate industry to meet with students in a "speed-networking" format, enabling students to participate in six-minute long informational interviews. Following the last round, students have the opportunity to network with those companies they didn't have the opportunity to meet with or to spend additional time with companies of interest to them. Company representatives receive a résumé book of student participants who attend the Expo, and many students receive call backs for follow-up interviews for open positions as a result of this event. See the expo in action. View our photo gallery from the 2018 Real Estate Career Expo. 17th Annual Real Estate Career Expo is scheduled for Tuesday, April 9, 2019. More details coming soon. Contact Jackie Greulich, associate director real estate student and career services, at (619) 260-7619 for more information about our Real Estate Career Expo, mentorship program and student and alumni recruitment opportunities.